The bookkeeping profession is as unregulated as it gets. How can you be sure that your bookkeeper is qualified? You have purchased QuickBooks and need training. How can you be sure to get the support you require? Jeri has a Masters degree in Accounting and Finance Management. She knows not only where to put the numbers but why. She can analyze your books and pinpoint the problems. Jeri has 10+ years of experience in bookkeeping, set-up, consulting, and training using QuickBooks. Jeri has been a Certified Advanced QuickBooks ProAdvisor since 2009. This is the highest Certification that QuickBooks issues. Visit Jeri’s Intuit profile for more testimonials! The accounting profession is changing. How accounting firms react to this change is do or die out. New technology, like QuickBooks Online, allows accountants and business owners to see their financial data in real time and perform accounting task just by connecting to the internet. Instead of clinging to the ways of the past, Andrews Tax Accounting embraces the new ways of accounting. What does it mean to have a QuickBooks certification? 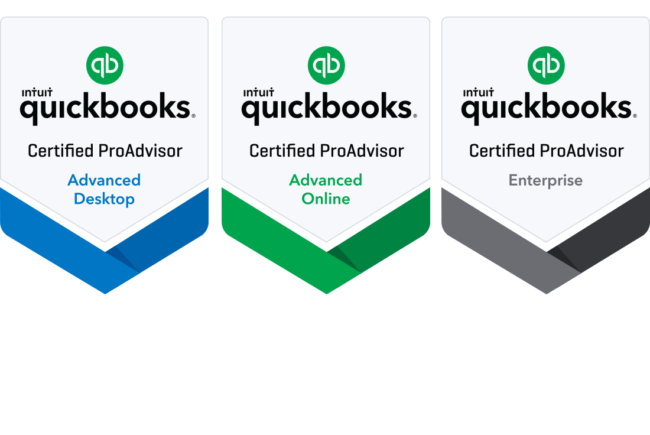 There are a few bookkeeping associations in the US that carry their own certification, but Intuit is the undisputed leader in the certification arena. They are, of course, a for-profit company and their certifications are extremely self-serving – it’s a way to further promote QuickBooks. However, Intuit and QuickBooks have become so dominant in the small business bookkeeping world that they are now the de-facto standard. Intuit’s QuickBooks ProAdvisor program is very well developed. The basic certification requires a professional to pass an online test that focuses on the understanding of how to best leverage QuickBooks. Certification is specific to the year of product release. Once a practitioner has been certified for 3 years in a row, they are allowed to take the Advanced ProAdvisor certification test. There are also certifications for specialized products such as QuickBooks Point of Sale and QuickBooks Enterprise Solutions. What's the value of a QuickBooks certification? The basic certification exam is not very difficult to pass, but the fact that a bookkeeper past the test shows that this bookkeeper invested the time and money to get it. It demonstrates that this bookkeeper is ambitious and committed to the job. Too many bookkeepers out there are doing bookkeeping just as a filler while they are looking for a better job. Knowing that your bookkeeper is dedicated enough to get certified is very important. Getting Advanced ProAdvisor Certification is a lot harder than the regular certification. In order to pass, you must be knowledgeable in both Accounting and QuickBooks, and be willing to invest the considerable time needed to take the exam. Advanced Certified ProAdvisors often do QuickBooks “Consulting” which is essentially the art of such special projects as complex configurations, setups, and cleanups. Advanced ProAdvisors often perform these tasks better than CPAs, as CPAs are typically not QuickBooks experts. CPAs can typically make their way around QuickBooks and fix common issues because of their deep accounting background, but Advanced ProAdvisors can do things with QuickBooks that almost no CPA can. Jeri Andrews has been my accountant for almost a year now and I have found her to be consistently responsive and helpful. I highly recommend her services. What does it mean to have a QuickBooks certifcation? A word of caution: If you see people claiming to be a QuickBooks ProAdvisor, it just means that they paid the fee for the year. It doesn’t mean that they are certified. Look for the word “Certified”: in “Certified QuickBooks ProAdvisor”.